Gold prices have seen significant gains in the past six months. A strong dollar has kept gold prices contained, but weakness in the greenback could see gold prices appreciate. The precious metal could well rise to a prior high of 1350 before the year is out. Back in October, I wrote an article anticipating that gold prices would climb higher, specifically to a level of 1350. In the current environment, both gold and the Japanese yen have been significant gains in 2019. Concerns over growth in the United States has led to the possibility that the Federal Reserve will not be raising rates further in the near future. Moreover, the ECB’s U-turn on raising rates by the end of this year has caused significant weakness in the euro. In this regard, it is not surprising that gold has been on the up. However, can this continue, and what can be expected from here? Recently, while US industrial production has declined to -0.1% in March (from a prior expectation of 0.1%), the equity markets have still been rallying, and this has brought gold back to a four-month low. With that being said, Credit Suisse (CS) is still bullish on higher gold prices for 2019, citing macroeconomic risks such as a ceasing of further rate hikes by the Federal Reserve, as well as geopolitical risks such as Brexit and the US-China trade war. That said, the main impediment to rising gold prices is a strong dollar. 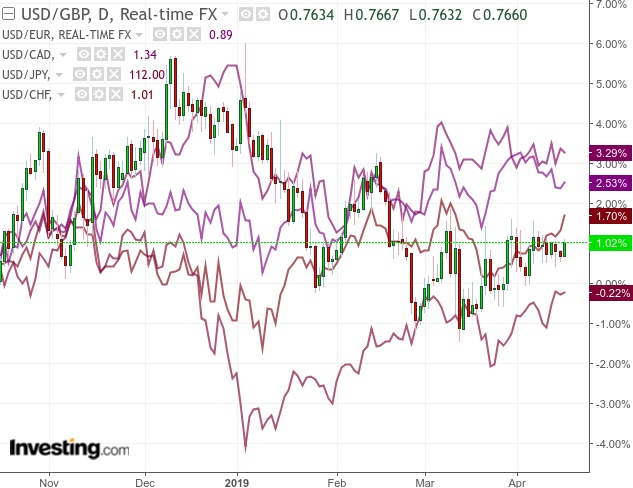 In this regard, should the dollar and yen remain strong, then it is likely that these currencies would act as a “safe haven” in favor of gold, and gold prices could subsequently see a decline. With this being said, the one factor that I would see as causing a significant rally in gold prices is an “about-face” by the Federal Reserve, where rates are actually lowered in order to stimulate economic growth. 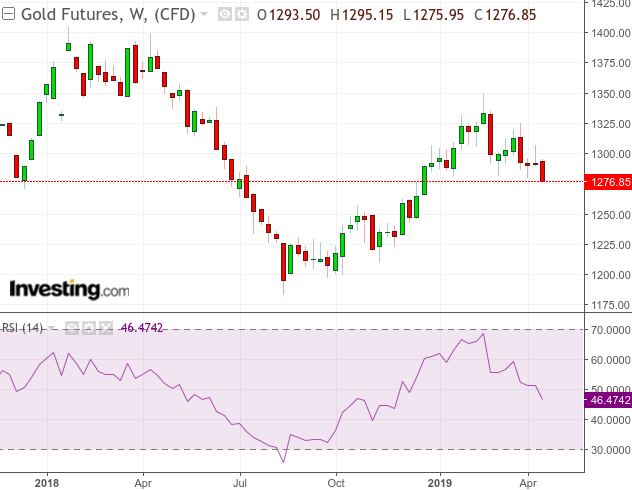 The dollar would likely see significant weakness under this scenario, and gold prices would most probably climb – a prior high of 1350 would not be unreasonable for the commodity. However, this could also be precipitated by indications that the Federal Reserve will not be raising rates for the rest of this year – if this leads to dollar weakness then gold prices could still climb to the cited level under this scenario. Gold prices are unlikely to continue rising on the back of trade tensions, as might have been the case before. For instance, with reports that Washington and Beijing are now “close to the final round” of trade negotiations, any recessionary conditions that would have been driven by trade tensions are now seeming more unlikely, and gold has declined as a result. Ultimately, the next moves for gold depend on global economic conditions and macroeconomic policy. Should we see a downward movement in the greenback as a result of a shift in monetary policy in the U.S, then gold prices could well rise as a result.